Senator David Norris calls for debate on the issue in the Seanad while MEP Paul Murphy brings up the Irish row in Strasbourg. MEP Paul Murphy in EU parliament yesterday; Senator David Norris in Seanad today. TWO IRISH PUBLIC representatives have raised the issue of homophobia in both the Irish and EU houses of parliament in the past 24 hours. 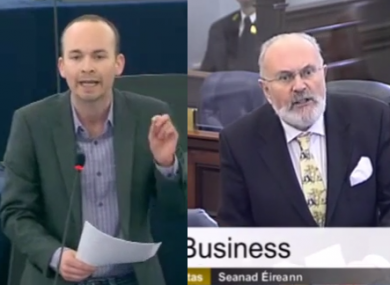 Socialist Party MEP for Dublin, Paul Murphy, and independent Senator David Norris, each made speeches to the EU parliament in Strasbourg and the Seanad, respectively. Senator David Norris today called for a debate on homophobia. I would like to join with other colleagues in asking for a debate on homophobia. I think it’s very important. There is an attempt being made now to close down this debate. And I think it a disgrace that RTÉ has shown such a gathering rush to pay up on this and I wonder what the legal advice they were given was, because I very much doubt if it was clearly in the line in which they took. So I think as a taxpayer, as a licence-payer and all the rest of it, I’d like to know why my money is being given to these people. I know that they won’t co-operate with Sipo, which is extraordinary. I know that they are controlled by a company which was called Lolek, which was founded in 2006. I’d like to know how they achieved their status in society. Yes, I have, I’ve already asked it, I’m going to continue asking for it. They are self-appointed, they are answerable to nobody. They have consistently misrepresented scientific papers and have been rebuked by the authors of those papers and they did that at the Convention of which I was a member. So it is amazing to me that they are allowed to bully people. Yes, it is very relevant because I have asked the question and I prefer not to be interrupted. I think it is extremely serious. I have to say to you Cathaoirleach, I’ve sat in this chamber and I listened to colleagues putting down motions that were effectively apartheid. Had I been a Roman Catholic, a black person, or a Jew, and anything that was attempted remotely like that, the person would have been fired out of this House straight away? Would you like to imagine Caothairleach, and my colleagues, how it felt like for me to sit here and hear valued collegues suggesting that I should not be allowed to purchase cake decorations or wedding invitations or this sort of business or denied the services of a hairdresser – as if I needed it. But, I mean, people should take this seriously. This country is rampant with homophobia. It is throughout the media. And there are decent people in the media who are terrified to open their mouths. And I hear all the time about the liberal 4 conspiracy and Dublin and the media. And, this, that, and, the other. Where the hell then are they? Where were they when I was being crucified? Where were they when Panti – a remarkable man – comes out and tells the truth. Tells the truth. So I would like to know. This might have the opportunity of turning the spotlight on the Iona Institute. And I’ve asked repeatedly. And I am asking the leader today as I asked his deputy but I didn’t get very far. And I’ve got to say this, Minister Rabbitte just equivocated the usual ould bladder. One side of his mouth, and then the other side of his mouth. I want to ask the leader another question. I want to ask him – will he instigate some degree of research into the Iona Institute? Where they’re getting their money from. Why they don’t cooperate with Sipo? Who made them an Institute? Well, it’s over time, OK. Fine. I said on Sunday the homophobes have had 2,000 years on the stage and I think we’re entitled to a few words now and again. Like the other MEPs, I have been inundated with emails claiming that this report represents an attack on the freedom of speech – because it condemns homophobia. It is deeply ironic because in Ireland at the moment, you have a real attack on the freedom of speech. National broadcaster, RTE, has censored Rory O’Neill for calling out homophobia, even worse than that, it has paid out €85,000 reportedly in damages to those accused of homophobia. It’s an attack by the right wing conservative forces in Ireland, acceded to by RTE, designed to censor debate in advance of a likely referendum on marriage equality. We must refuse to be silenced. When John Waters says that gay marriage is ‘a kind of satire’, that is homophobia. When Breda O’Brien says ‘equality must take second place to the common good’, that is homophobia. When the Iona Institute campaign against gay marriage because it is gay marriage, that is homophobia. In the words of Rory O’Neill, these people should get the hell out of our lives. Email “David Norris and Paul Murphy raise homophobia in Irish and EU parliaments”. Feedback on “David Norris and Paul Murphy raise homophobia in Irish and EU parliaments”.